purchased checkered red and white cloth to sew suspenders/overalls. Red Trim for his overall straps. I purchased a plain white T-shirt and went to the craft store and purchased iron on lettering and ironed on the decals to the shirt to read BIG BOY. Then I went to the local fabric shop to find a print and a pattern for the overalls. I then went to my aunts who has a sewing machine (I don't have one). I then cut out the pattern for the overalls and sewed the overalls and some straps for the overalls. I then applied a few buttons to hold the straps into place. Wahlah, the outfit was done. I think it only took 2-3 days to complete the project. It was actually my husband’s idea, I just ran with it! 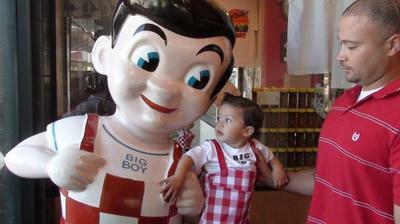 It was a lot of fun to get him dressed, slick his hair like Bob's Big Boy and take him out on Halloween morning and have breakfast at Bob's Big Boy's. The restaurant and it's patrons were thrilled as much as we were! !